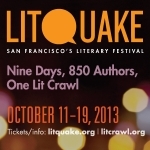 Yesterday I attended my first Litquake event of the season. Lapham’s Quarterly convened a panel to read from their new issue on subjects close to my heart: Death & Dying. The description of the event listed John Crowley first in the lineup. I’ve been a fan of his since Little, Big won all the awards 30 years ago. I packed my underlined and dog-eared copy of Aegypt to humbly present for his signature. I’ve read Little, Big to pieces. I don’t know what happened to Crowley. The moderator apologized that Lewis Lapham, the magazine’s founder, couldn’t attend, but no one explained why Crowley had been replaced by Sandra M. Gilbert. I gave her book Death’s Door: Modern Dying and the Ways We Grieve one star because it veered away from what was interesting about grieving into literary theory. To say I was disappointed might be understatement. Then she spoke briefly about the premature child she lost, the husband killed on the operating table by a surgeon’s incompetence. As in her book, she mentioned her grief but shied from sharing it, hiding instead behind definitions of expire and termination: valid and to the point, but not meaty. Timothy Don read a really illuminating essay by Montaigne, “To Philosophize is to Learn to Die.” That piece is probably worth the price of the Lapham’s issue. I suspect that Montaigne is the author of many of the quotes in the Paris Catacombs, but I’ll have to examine the text to be sure. Finally, Jeff Sharlet read an excerpt from C.S. Lewis’s “A Grief Observed.” The fury recorded by a man who’d lost his faith in the face of his grief was breath-taking. “Why should the separation (if nothing else) which so agonizes the lover who is left behind be painless to the lover who departs?” he asks. I’d always considered the dead to be beyond pain, beyond grief. How horrible if that isn’t true. The hour was over too quickly and left me much food for thought. I look forward to diving into the new Lapham’s Quarterly. I’m still disappointed to miss John Crowley in person, though. This entry was posted in Live Events and tagged C.S. Lewis, death, grief, Laphams Quarterly, Litquake 2013. Bookmark the permalink. Now I must read “A Grief Observed.” An interesting experience for you. It really was interesting, even though it was a completely different experience than the one I was expecting. I’m glad to see one academic isn’t interchangeable with another.